My saddle is the missing part of todays bikes. A chance for those who have not been cycling a lot yet to change that. 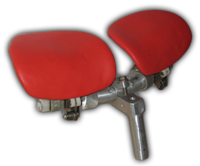 Until now nobody thought about cycling faster by means of a special saddle. Unfortunately for many people my saddle does not mean anything because they do not understand it. Propably I am to early with my saddle - but fortunately early enough for me.